What led to the Texas Citrus Pest and Disease Management Corporation being formed? Huanglongbing (HLB), better known as citrus greening disease, is endemic in large parts of Asia and Africa and has now made an impact on the Americas. Since 2005, Texas has watched from afar as Florida struggled with citrus greening disease. We knew the devastation that this incurable tree disease could cause as it spreads very quickly, has a lengthy latency period and eventually kills the tree. The Texas citrus industry prepared as much as possible for this disease, but it was still a shock when the first tree was identified in San Juan, Texas with citrus greening disease on January 13, 2012. Citrus greening disease is an incurable citrus tree disease that is spread by a small insect, the Asian citrus psyllid (ACP). The only form of prevention for this disease is to treat against ACP. The industry and growers banded together to create an Area-Wide Management Program. What is the Texas Citrus Pest and Disease Management Corporation? Prior to finding citrus greening in Texas, Industry leaders and the state of Texas recognized the potential for our industry to face this disease was very strong, given that ACP was already present in Texas. In 2009, The Texas Legislature, on the request from Industry leaders and growers alike, established a nonprofit corporation, The Texas Citrus Pest and Disease Management Corporation (TCPDMC). The statute gives the Commissioner of Agriculture the authority to recognize the Texas Citrus Pest and Disease Management Corporation to plan, carry out, and operate suppression programs to manage and control pests and diseases. The mission of the Texas Citrus Pest and Disease Management Corporation, as declared in the Texas Agriculture Code §80.002, is to manage and control citrus pests and diseases in citrus plants in the state of Texas by planning, carrying-out and operating a suppression program while incorporating an area-wide, integrated pest management approach. What is the Referendum and why is it important? A referendum is a public vote on a particular issue. The importance of this vote is to allow citrus growers the ability to lead the efforts of a suppression program and drive the importance of the suppression of pests and diseases. WHAT IS THE VOTE FOR? If you are listed as having an agricultural exemption in Cameron, Hidalgo or Willacy Counties, you will receive a ballot mailed to the address listed on your tax records. You will receive the Ballot prior to October 12, 2016, at which time voting begins. If you do not receive a ballot in the mail, but feel that you are qualified to vote, you can request a ballot by calling 956-580-8004 or by picking up a ballot at your local Agriculture Extension Office. Ballots are due back to the Texas Department of Agriculture postmarked October 24, 2016. Other than citrus greening disease, what else does the Texas Citrus Pest and Disease Management Corporation cover? In 2009, when the TCPDMC was voted into existence, it was to specifically focus on HLB and ACP. Over the past few years, the Mexican Fruit fly detections were rapidly increasing and quarantines were inhibiting grower’s abilities to sell their fruit. Growers requested that TCPDMC change its mission to include all major pests and diseases in its scope and in 2015 the Texas Legislature made this change to the statute. In October 2015, citrus canker was found on a residential lime tree in the Brownsville area. To date there have been 154 lime or lemon trees positively identified with citrus canker in the RGV and 2 trees in Houston. Citrus canker is a highly contagious bacterial disease that causes lesions on the leaves, stems and fruit of citrus trees. Citrus canker has not been found in South Texas since the 1940’s and it is imperative that TCPDMC works alongside TDA and USDA-APHIS in eradicating this disease before it is widespread. What is the goal of the proposed ACP suppression program? The goal of the program is to slow down the spread of HLB within the Texas citrus industry’s production area through an all-inclusive effort at suppressing the insect that carries the disease, the Asian Citrus Psyllid (ACP). Voluntary efforts at suppression over the last 6 years (2010 – present) have produced generally positive results but HLB incidence in both trees and ACP is now accelerating throughout the production area. The TCPDMC Board (comprised of 10 growers, 2 allied members, 1 pest management member, 1 agriculture lender and 1 entomologist) has determined it necessary to propose (via referendum) that an ACP suppression program be created to support this goal. If successful, this program will buy time for more permanent solutions to the HLB epidemic which may include transgenic varieties that are tolerant of or immune to infection. This is a matter of survival for the industry. The area that would be considered under this program would include Cameron, Hidalgo and Willacy counties. This would be considered the pest management zone. The pest management zone (Cameron, Hidalgo & Willacy Counties) is divided into 5 routes. One scout is assigned to each route totaling 5 scouts. The basic unit for reporting is a 2-week cycle. In each cycle, a scout will monitor approximately 125 groves per route for ACP presence using yellow-sticky traps for adult insects and visual observation for insect eggs and nymphs. These same groves will be scouted for 3 consecutive cycles (6 weeks) to determine whether ACP population levels are in compliance through the treatment program that each respective grower is employing at that moment. Compliance is achieved in any individual grove by a finding of ACP population levels at or below a threshold of 10 adults and 0 eggs/nymphs per grove. If a grove stays at or below the accepted threshold for all 3 consecutive cycles, the grove is considered in compliance and monitoring is terminated after the end of the 3rd cycle. If ACP population levels are above threshold (non- compliance) during any of the 3 consecutive cycles, as a first step at helping to improve the situation the TCPDMC will provide educational materials on suggested treatment programs to the affected grove owner and request that they arrange treatment for the grove as soon as possible. On the next scheduled visit (2 weeks later), if ACP levels remain out of compliance a certified letter will be sent to the grove owner requesting again that they treat for ACP. On the third visit (1 month after initial non-compliance), if ACP levels remain out of compliance the TCPDMC will initiate its own treatment of the grove as soon as possible. A follow-up visit will be conducted 1-2 weeks post-treatment to confirm that ACP levels are in compliance after which monitoring in that block will terminate. It is anticipated that as part of this effort every managed grove will be monitored for at least 3 consecutive cycles per year, possibly more. In addition to the suppression program, the TCPDMC proposes to continue providing an ACP monitoring service to interested growers. This effort would represent approximately one-third of the total scouting effort put forth by the TCPDMC in any given cycle. Using approximately 2,500 sq. ft. of greenhouse space, the TCPDMC plans to produce a biological predator called Tamarixia radiata and release them in: A) Residential areas near conventionally-treated groves throughout the citrus production zone B) Organically-certified commercial groves throughout the citrus production zone C) Abandoned and smaller residential groves (not traditionally managed for ACP) In conjunction with their other assigned duties, releases will be conducted by scouting and field management personnel on a daily basis to ensure that a steady saturation of priority release points occurs throughout the growing season. Among growers, TCPDMC will continue to promote strategic treatment of ACP in August (combined with major Rust mite treatment) and then again during the dormant season (mid-November thru mid-February) through mail outs and meetings. Public Community Outreach will provide educational information to the general public through multiple outreach events throughout the production area. These activities will be done through grant funding and special project needs. Want to learn more about the upcoming Referendum for Citrus Producers? Combines the two reddest varieties – Rio Red and Star Ruby grapefruit. It has an overall blush on the exterior peel with a deep red interior color which is 7 to 10 times redder than the Ruby Red. Includes the famous Ruby Red, and other redder varieties – Henderson and Ray. Its smooth, yellow skin is naturally tinged with a reddish blush, and an interior color 3 to 5 times redder than Ruby Red. Red but not too red, with the sweet, delectable taste as the Ruby-Sweet and Rio Star. Available at certain times from October through May. All varieties are available in grocery stores from October to May. The origin of the Grapefruit, also known by its Latin name, Citrus paradisii, has been a puzzle to historians and pomologists for years. The only citrus strain not found to have originated in Southeast Asia, the grapefruit was obtained in the West Indies around the 1700s. Years later, research confirmed that grapefruit is a hybrid of a pummelo (citrus grandis), and the sweet orange (citrus sinensis).Originally known as “the forbidden fruit”, it wasn’t until the 1800′s that a Jamaican farmer called the fruit “grapefruit” for the grape-like cluster in which it grows on trees. In 1823, grapefruit made its way to the United States in the form of seeds brought by either Spanish or French settlers to Florida. Eventually, grapefruit made its way to South Texas, most likely by visiting Spanish missionaries. The first reported planting of a grove in Texas was 1893. Initial grapefruit plantings in Texas were the white varieties, followed by pink varieties. 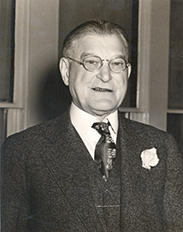 John H. Shary, a developer originally from Omaha, Nebraska, was so impressed by the small crop raised by early citrus experimenters that he felt citrus was the crop of the future for Texas. Shary, also known as the “Father of the Citrus Industry”, combined his interest in growing citrus with the latest irrigation techniques and a determination to sell valley citrus commercially. 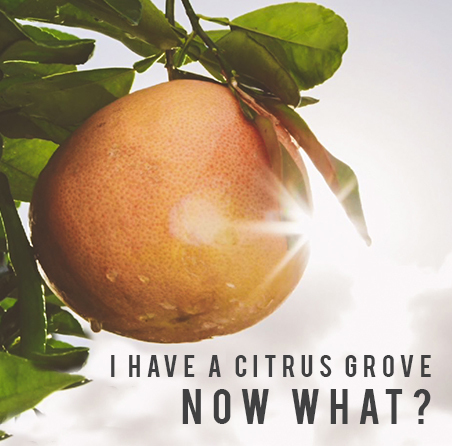 In 1914, he bought 16,000 acres of brush land and after clearing it, proceeded to grow his first crop of seeded white grapefruit. 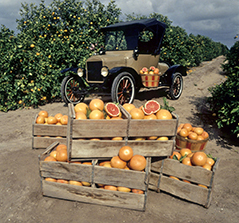 The first commercial shipment of citrus – packed in onion crates – left the Lower Rio Grande Valley of South Texas in 1920. It was about the time of the great stock market crash in 1929 when an accidental discovery of red grapefruit growing on a pink grapefruit tree gave rise to the Texas Red Grapefruit Industry. In the late 1920′s and early 1930′s redder bud mutations were found in numerous groves. Each new finding was named for the grower who found it. With several red grapefruit varieties and names being shipped commercially, keeping track of it soon became a marketing problem. All the red varieties of fruit started being marketed under the name “Ruby”. The “Ruby” Red Grapefruit was the first grapefruit to be granted a U.S. patent. Following freezes in 1949, 1951, and 1962, Texas eliminated its white and pink varieties, and set out to establish its reputation for growing the red grapefruit. During the 1970′s, several important mutations found on the “Ruby” trees produced fruit even redder than the 1929 Ruby Red grapefruit. Each finding again took the name of the grower who discovered it. Dr. Richard Hensz of the Texas A&I Citrus Center (now known as the A&M Citrus Center) spent many years in the laboratory, working to produce the reddest grapefruit through mutations induced by ionizing radiation. In 1970 the Star Ruby variety was released followed by the Rio Red variety in 1984. With so many red varieties with varying degrees of redness, the industry was again faced with a marketing dilemma. To differentiate the Texas sweet, red grapefruit – a superior tasting grapefruit – from those other grapefruit, the industry now markets its fruit under two registered trademarked categories: Ruby-Sweet and Rio Star. The South Texas sub-tropical climate, fertile soil, and sunny weather work together to provide excellent growing conditions. Texas citrus growers carefully maintain crop quality through successful irrigation techniques, growing conditions and extensive research. 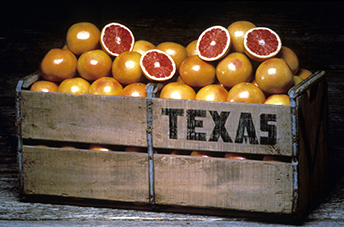 Texas grapefruit is tree-ripened and hand-picked to ensure the best quality possible. After picking, area shippers wash, inspect, grade and hand-pack the fruit. It’s then shipped to supermarkets across the United States. and Canada. So peel that outer skin and reveal the sweet, juicy, red interior for yourself. Try a Rio Star or Ruby-Sweet grapefruit today!